A significant amount of new feed intake data is set to be included in the June 2016 BREEDPLAN analysis. This is a direct result of the feed intake data being collected in the Angus Sire Benchmarking Project (ASBP). This new data has been collected and analysed on all steer progeny of the Cohort 4 sires, meaning Net Feed Intake EBVs, based on direct feed intake data, will be available for sires in Cohorts 1, 2, 3 and 4 of the ASBP. The feed intake data is collected at UNE’s Tullimba feedlot, Kingstown, NSW. Collectively this includes feed intake data on 1,763 steers from ASBP Cohorts 1, 2, 3 and 4, with 284 of these records coming from the Cohort 4 bred steers. 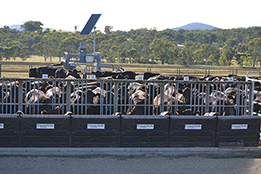 The feed intake and growth data collected through the ASBP feeds directly into Angus BREEDPLAN to produce the Net Feed Intake – Feedlot Finishing EBV (NFI-F EBV). This EBV is an estimate of genetic differences between animals in feed intake at a standard weight and rate of weight gain when animals are in a feedlot finishing phase. NFI-F EBVs as expressed as kilograms (kg) of feed intake per day. Lower, or more negative, NFI-F EBVs are more favourable. For example, a bull with a NFI-F EBV of –0.6 kg/day would be expected to produce progeny that eat less feed per day than the progeny from a bull that has a NFI-F EBV of +0.8 kg/day (when the progeny are of similar weight, are growing at a similar rate, and are in a feedlot finishing phase).